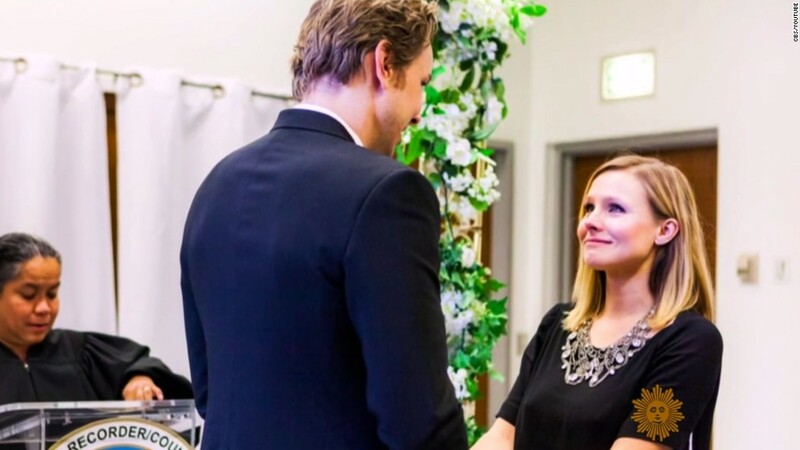 Kristen Bell has never released any wedding photos, until now. The actress sat down with "CBS Sunday Morning" and gave viewers the first-ever glimpse into her 2013 wedding to actor, Dax Shepard. Bell shared three photos from their wedding day. One shows them exchanging vows with Bell visibly emotional. 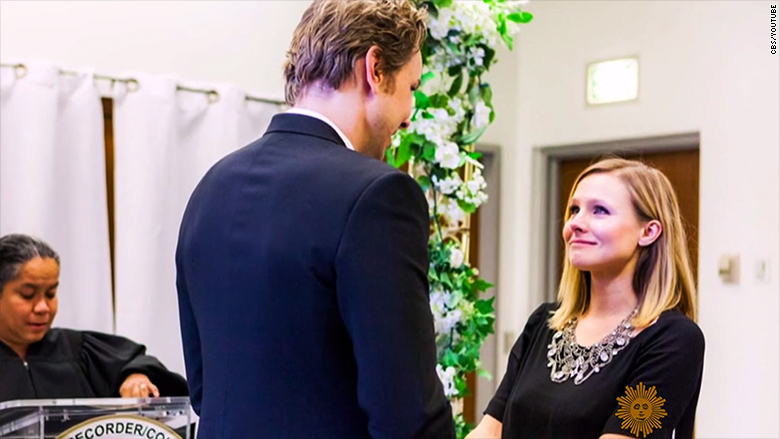 Kristen Bell and Dax Shepard exchange vows at a Beverly Hills courthouse in 2013. Another photo is of Bell and Shepard signing their marriage license. A third photo shows the newlyweds sealing their ceremony with a kiss. Bell and Shepard have been married for nearly three years and have two children. Shortly after their wedding, Shepard went on "Jimmy Kimmel Live!" and revealed that they got a lot of bang for their buck by having a courthouse wedding. "So we went to the Beverly Hills Court House and all in, with fuel to get there, $142 out the door." Nearly three years later, the Hollywood couple have two children together, Lincoln, age 3, and Delta 18 months. "He's a wonderful father," Bell said tearfully. "He knows the value of things. He was an addict for many, many years and he pulled himself out of it, and he's been sober for 11, 12 years now. And he knows how many times he's messed up and how many times he's been really close to losing everything."